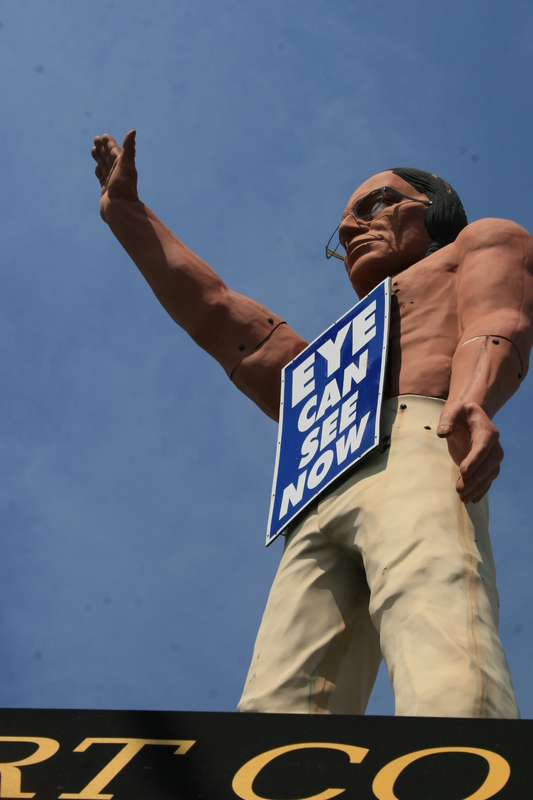 The Eye Care Indian is a must on any Muffler Man excursion in the Chicago area. The statue has been there since the 1970s or possibly the 1960s. We visited him while shooting for Episodes #5-7 in the Chicago area for American Giants. Bo stayed in the car the entire time while Neto and I ran around shooting photos and video. Since it was the weekend and the business was closed, we didn’t have a chance to talk with anyone about the statue’s history. So far, my phone calls have not been returned. However, there are a few interesting details that we know about this Indian Brave version of the Muffler Man. First off, this is the only Muffler Man that I know of that wears glasses. Eye glasses were not a Muffler Man accessory and certainly would not have been appropriate for the Paul Bunyan or Cowboy models. Maybe a Half Wit model could have pulled it off. Back in the 1970s, this Indian advertised for a Capitol Cigar. There was a banner on his chest advertising “White Owl Cigars”. During that time, someone had implanted an arrow in his chest. Sometime between 2001 and 2006, the cigar shop sign was later replaced with a sign that reads “Eye Can See Now”. The statue still holds his salute after all these years at the northwest corner of 63rd and Pulaski. 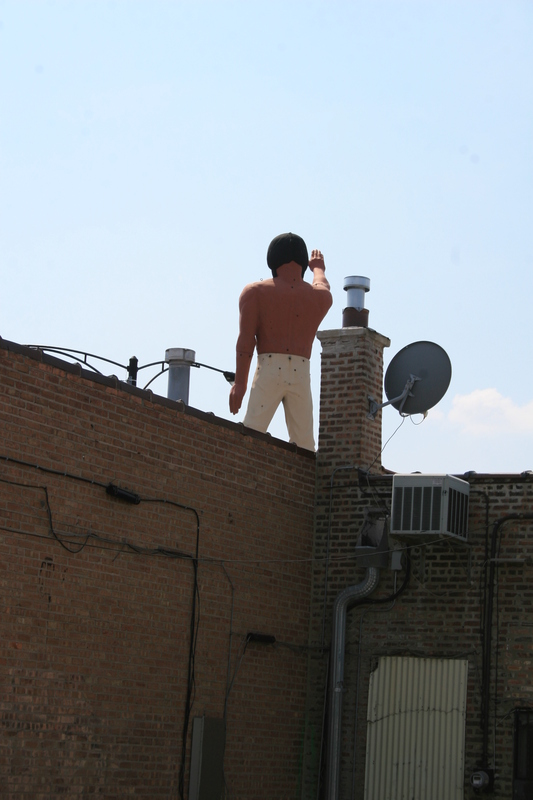 This is one of the few Muffler Men statues to appear in a movie and can be seen in “Wayne’s World” which was released in 2001.